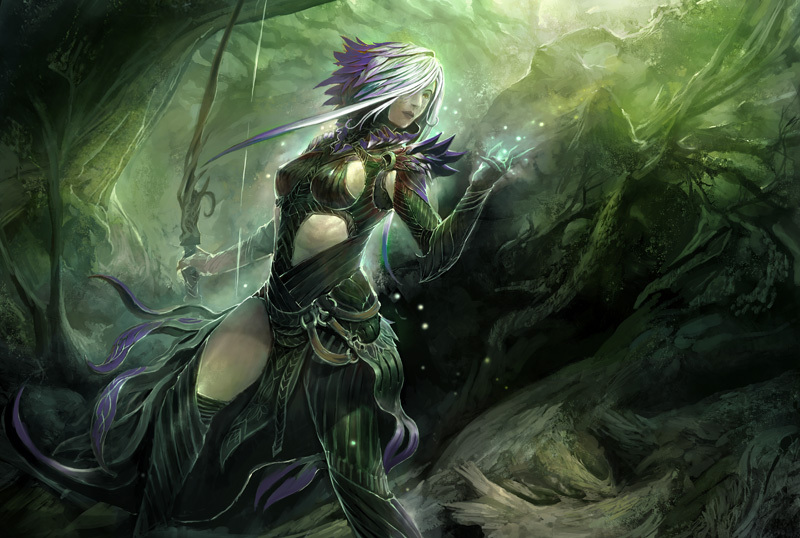 Growth Path Of New Players to Guild Wars 2 Sylvari are not born. They awaken beneath the Pale Tree with knowledge gleaned in their pre-life Dream. These noble beings travel, seeking adventure and pursuing quests. They struggle to balance curiosity with duty, eagerness with chivalry, and warfare with honor. Magic and mystery entwine to shape the future of this race that has so recently appeared. The sylvari are omnivorous humanoid plants. Some sylvari closely resemble humans but with a fey cast to their features such as tilted eyes and pointed ear tips; most display plantlike features such as hard wood for bone structure, have foliage and petals for hair, and bark acting as flesh. Golden sap moves through their veins instead of blood and pollen falls off of them as they move. They are much more slender than the average human and about a head shorter. While sylvari can seemingly absorb sunlight and become rejuvenated, they still must eat and drink to survive. Sylvari do infact have thermoreceptors as referenced by a Sylvari explorer in the Grove. She states that she dislikes Hoelbrak as it is too cold. Sylvari emerge fully formed from blue fruit pods which grow on the branches of the Pale Tree. Their “gender” is selected by the Pale Tree prior to emergence and is distinguished by the same general features as human genders. It is unknown whether the sylvari die of old age as sylvari have only died through violence, poison or disease so far and no sylvari has shown signs of aging. When a sylvari is harmed, instead of scarring tissue they heal via tendrils and expanding bark, but heal at the same general rate as humans.All sylvari have luminescent cells in their skin, causing them to glow in the dark. Prior to emergence they share a bond through the Pale Tree which they call the Dream of Dreams. In this dream a growing sylvari is exposed to the consciousness of the Pale Tree and the vast pool of knowledge and memories of what every other sylvari has thought and learned of the world. When they emerge a portion of this knowledge remains with them, including basic wisdom and understanding from the Pale Tree and a small fraction of what other sylvari have seen and experienced, though this rarely includes specific memories. After emergence the bond with the Pale Tree is weaker but it links all sylvari and, to an extent, other plants. On rare occasion twins can emerge from the same pod and they exhibit a greater empathy toward one another. Sylvari are usually honest, direct and focused, taking most things at face value. With the dream ensuring there is so much in common with the other sylvari, experience is cherished for creating uniqueness between them. They are eager to learn, experience and understand. Sylvari morality and ethics are based on those of the Pale Tree. These were formed by following the lives of Ronan and Ventari, during the early growth of the Pale Tree and later written on Ventari’s Tablet situated at the base of the tree. After emergence a sylvari is guided by older sylvari to understand what they have dreamed and ensure they have a clear understanding of the tablet, their history and the world. Despite the kick start of knowledge from the dream they still seem naive as there are some matters which seem beyond their comprehension. Emotions and tact, in particular, are difficult for them to grasp, so often a sylvari will state out loud something which would normally be politely avoided by other races. Death too is not fully understood but viewed as something to be embraced and, as with many things in a sylvari’s life, is viewed with a great degree of curiosity. These views serve to form an acceptance of and fascination with death that other races may find disturbing. As they are all born from the Pale Tree they could be considered all of the same family; however, their family bond is not as strong as most families, with many sylvari considering others more like distant relatives with few exceptions, such as twins born from the same pod or those who shared dreams, though the latter may also result in lovers. Romance is practiced among the sylvari, disregarding gender between those involved. To a sylvari, love is spiritual and eternal, and it has nothing at all to do with the physical form or physical contact. 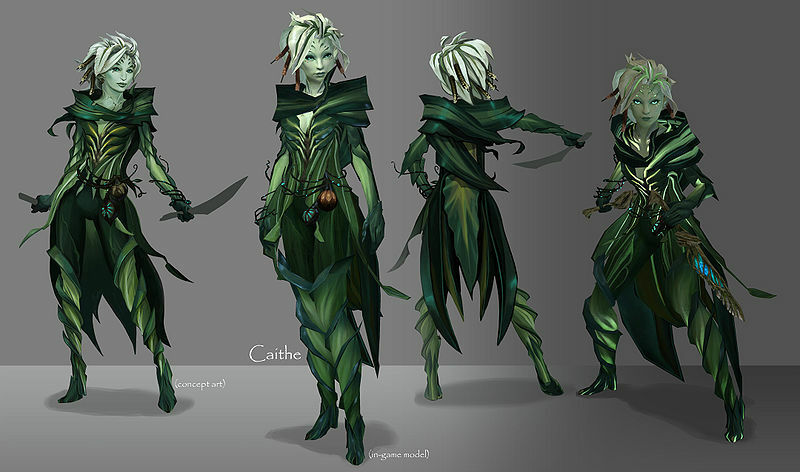 Sylvari craft their armor and weapons from organic material, such as roots, leaves or leather, and sometimes grow their armor out of their own bodies in the form of leafy padding, spines or bark. This entry was posted in GW2 Guides, other. Bookmark the permalink.